On Monday, December 15th my last grandparent passed away. 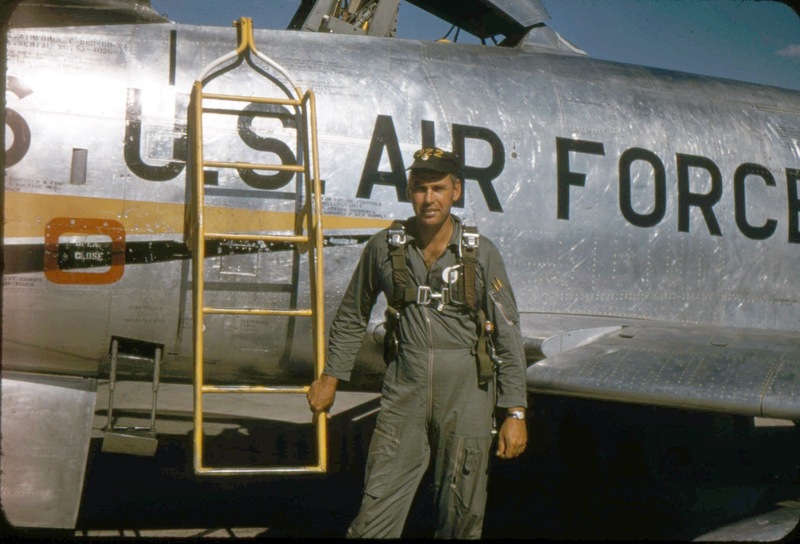 William Atkinson Shepard, jr. He was 94 years old. Only few weeks short of being 95. 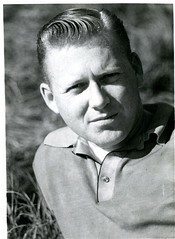 Bill, as he was known by family, was the son of William Atkinson Shepard, sr. and Rachel Hays. He was born in Ohio spending his formative years there and first saw my future grandmother, Lois Shaw, while sitting in church one day. He joined the US Army Air Corps (which eventually became the United States Air Force), on June 12, 1942 during World War II. Bill and Lois had 5 children. The first, William Gerald, didn’t live but a day after being born. Lawrence Alan died in a car accident in 1978 after being hit by a driver who fell asleep at the wheel. I am sorry that I didn’t know my grandparents better, but travel and distance made it difficult. 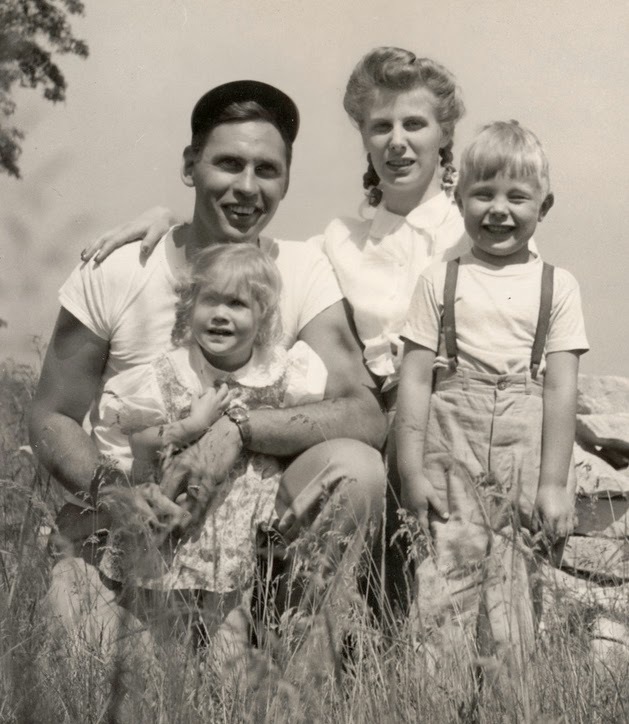 My favorite memory of my grandfather is his stories, he was a great story teller, certainly not a skill I inherited. 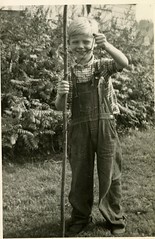 He would open the trunk in the attic of their house on Sugar Hill in Maine and pull out stories of Brer Rabbit and that briar patch and read them to me and my brother and sister. Like my grandmother he donated his body to science. 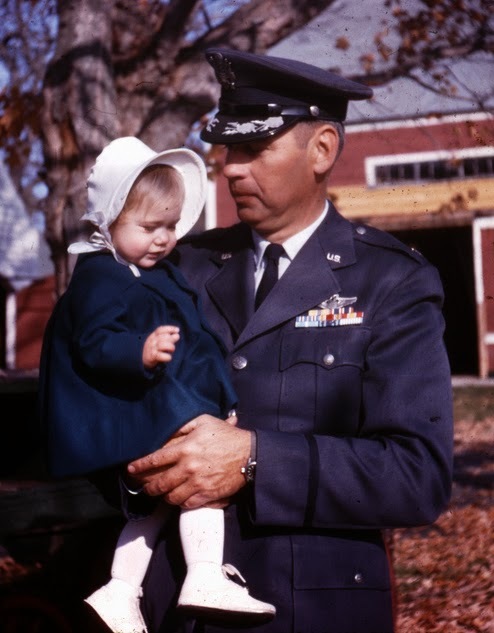 I can’t really find the words to memorialize my grandfather with, but I do have pictures. So here are a few of my favorites. 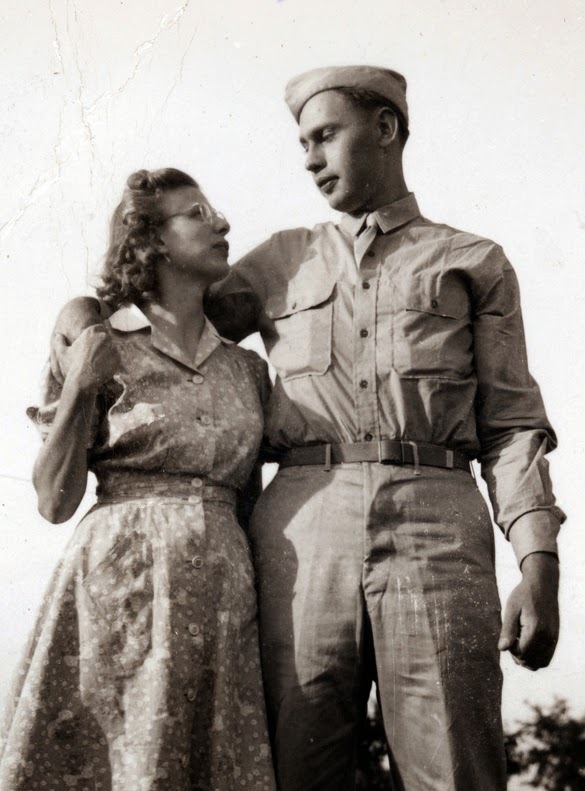 Starting with Bill and Lois looking so young, starting their life out together. Grandfather and Grandmother with Sue and Ken, the eldest two. 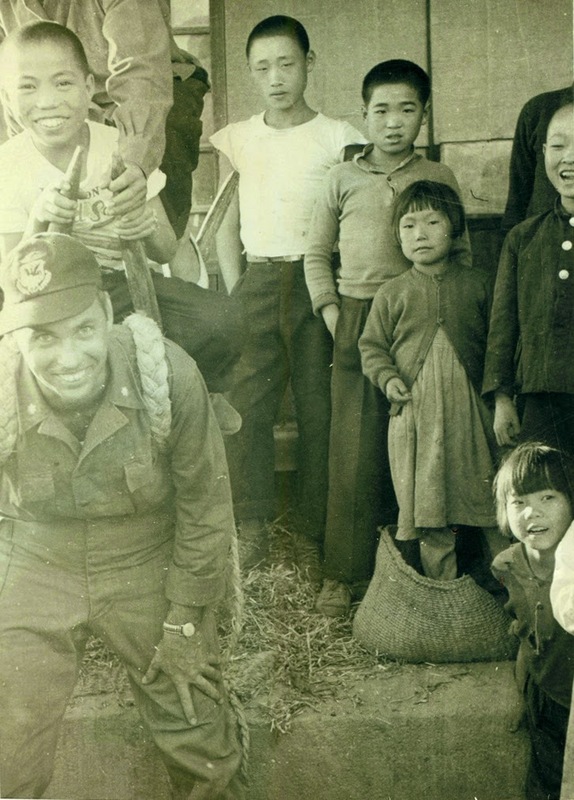 This is grandfather in Korea. 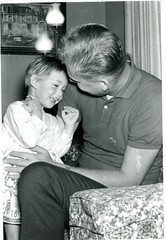 My favorite picture of me and my grandfather, this would have been about 1963. 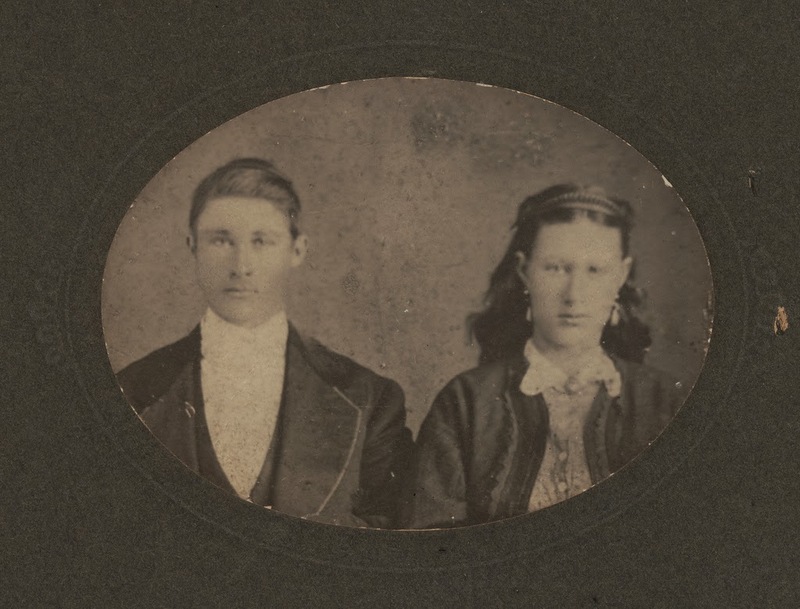 Margaret Mobley married William Buchanan in Monroe County, Ohio about 1850. The reason I know her parent’s names is because, fortunately, they are listed on her death record in Jackson County, West Virginia, William and Sarah Mabley, now the last name is mangled, but that is nothing new in genealogical research. 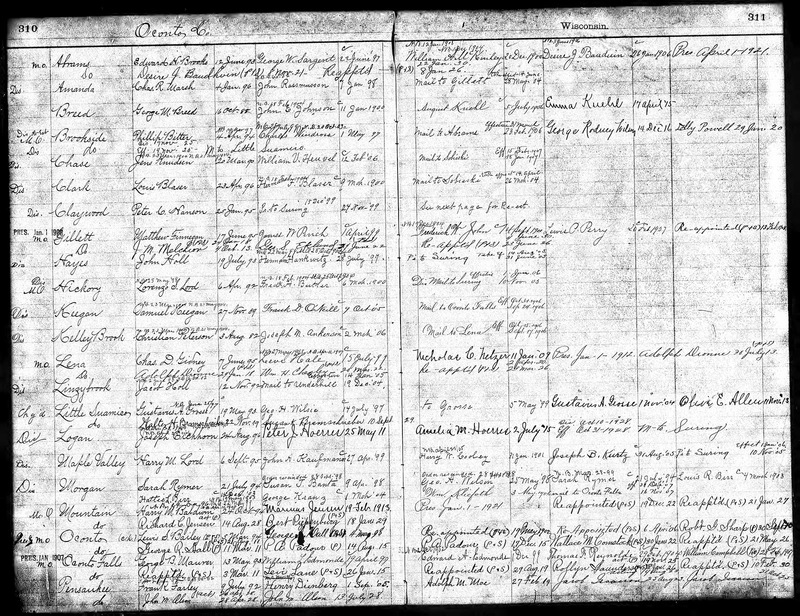 I used the parents names in a search of Ohio marriages because that is where Margaret and William lived before they moved to West Virginia, and found one for a William Mobley and Sarah Millison for 10 November 1825, in Belmont County, Ohio. This record fits nicely with Margaret’s birth which is about 1833. The finding of this marriage record was pretty compelling, so I decided to pursue this line of research. Like a large majority of genealogists my research tends to focus on our direct ancestors. In my case, I move on to siblings when I have run out of sources that will help me move further back, or forward depending on your point of view. In Margaret Mobley’s case I had no idea who her siblings were. One of the reasons is because only the 1850 census shows her parents, William and Sarah, with any of their likely children named. In this case the child is Silas about 12 or 13 years of age. Well, it looks like Silas was my next victim. I decided to look at other genealogists family trees that include William and Sarah Mobley at ancestry.com and found one interesting entry. They had Silas listed, as a son of the same parents as Margaret, who married Rebecca Buchanan. Interesting coincidence, as William Buchanan had a sister named Rebecca. One of the daughters of Silas was named Sarah, and she is entered as having married a Bloom. Very interesting. ‘Why is this very interesting?’ you ask with baited breath. Because, I have a photograph in our family photo collection of a Sarah Mobley Bloom who married William, and it was addressed on the back to Jane Buchanan, who would be her cousin. William Bloom, a handsome devil isn’t he, and his wife Sarah Mobley Bloom. She died young in her 30s or 40s I believe. Gotcha! Proceed with celebratory fist bump. So without any actual documented proof, both the family tree entry I found and this picture pretty much confirm my theory of the parents of Margaret being William Mobley and Sarah Millison. I feel quite confident in proceeding with this line of inquiry. So it is off to the Millisons of Ohio and Pennsylvania. Shortly after settling on the Connecticut river in the latter part of the 1600s, William Shepard was out on a boat in Boston Harbor with William Lee. 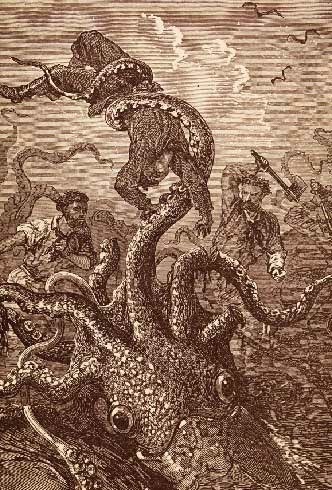 I will assume this is why none of our Shepards are sailors. Some say this story is pure fabrication, who knows. It certainly makes for a more interesting story than the fact that his wife divorced him for desertion and that’s why he wasn’t around. 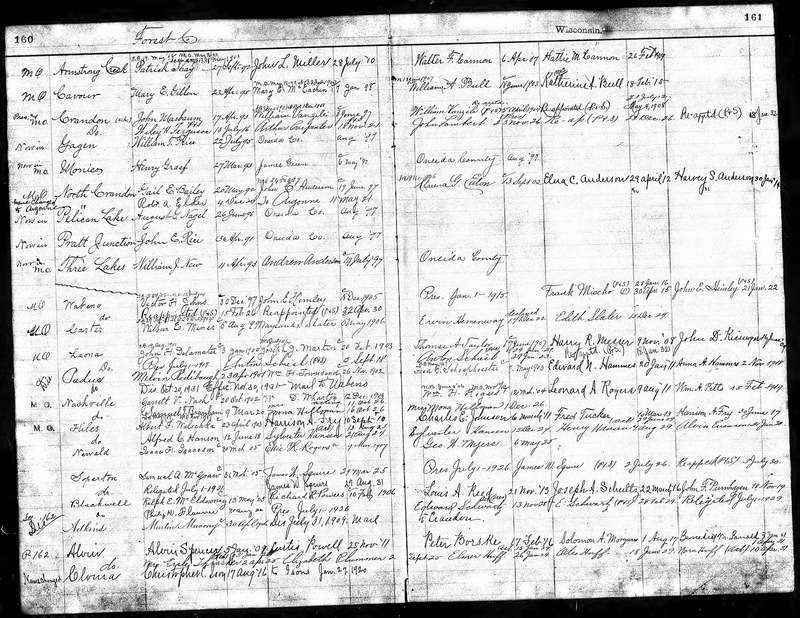 Ancestry.com has a database on their site of Hamburg passenger lists. That would be those people leaving Germany from the port of Hamburg. Recently there has been an update to the database which includes an index of the records from 1850 to about 1890, I think, anyway is covers the dates I need. The great thing about this index is that it is the Archives in Germany that is doing it. Which means that the information from the transcription will be more accurate. In my case, I was hoping to see a refinement of the entry for Frederick William John and Henrietta Volk in the records. Which I did. The transcription confirmed that which I believed to be true, but wasn’t quite sure of, F W John and his wife Henrietta both indicated that they were born in Altraden, Posen, Prussia. It’s not ground breaking news, but it makes me feel better about including the information in my own records. FW’s brother August did not have to give the same information when he emigrated in 1855, he only had to say where he was from, that could just mean where he last lived. We have that information. At this time there are very few accessible records for Altraden for me to look at. I do keep checking up on Posen websites as there are a few indexing projects going on from church records, but it might be a while before we find anything, if ever. I am back from my trip to Salt Lake City. Who would think that a weeks vacation could be that exhausting. I spent many an hour looking bleary eyed at microfilm. All in an effort to find something new about our ancestors. I am happy to say that I did find a tidbit or two. Firstly, until just this last week I had no idea when Jennie/Jannett Smith Rosa Lavelley died. I did know it was after 1870 and before 1898 (according to her ex-husband, Abram Rosa’s, pension). But this week I found a quit claim deed filed in Berrien County, Michigan labeled ‘Jannett Rosa, by heirs’ to Michael Smith [her brother]. The incriminating bit of information in that index entry was the ‘by heirs’ part. The deed was filed in 1877. Okay, it didn’t give me the exact date of death, but now I know that Jennie died between 1870 and 1877, a much shorter date range. Who knows, maybe a bit of digging in my own backyard will turn up more on that issue, after all she lived in Oconto. Secondly, the Buchanan family has been researched by others, but some of what they have put out there is wrong. I now know that Margaret and William Buchanan died in Jackson County, West Virginia. Margaret in 1883 and William in 1891. I found their death records online. Easy peasy. Well, after Margaret died, William must have been feeling a bit lonely because he married again in 1884 to an Emily Duke. How do I know this, land records. William and Emily are selling land together to family, etc. in Jackson County in the 1880s. It took me a while to realize that the name of his wife was Emily in the deeds as I am mostly just photographing records and looking at them later. I am glad I did though. Now I can add Emily to the records. I even confirmed the marriage by finding their certificate online. Thirdly, After learning about Emily, I dug around on Ancestry to see if there was something I missed about William Buchanan in their online records. William is the first Shepard side ancestor I have found to have been an actual soldier in the Civil War. He joined the Union’s 17th Regiment, Company D, Infantry. He was only in the war for about a year, the same as F. W. John. He appears to have survived the war without any incidents. But, he didn’t live long enough to file a pension having died in 1891. Emily his wife died by 1900, as we know from the land records. When she died the land she inherited from William, had to pass on to his children: Jane, Ebenezer, Rebecca and Sarah. All in all I have had affirmed in my mind the importance of land records in doing one’s research. It can lead you to finding all kinds of little gems. 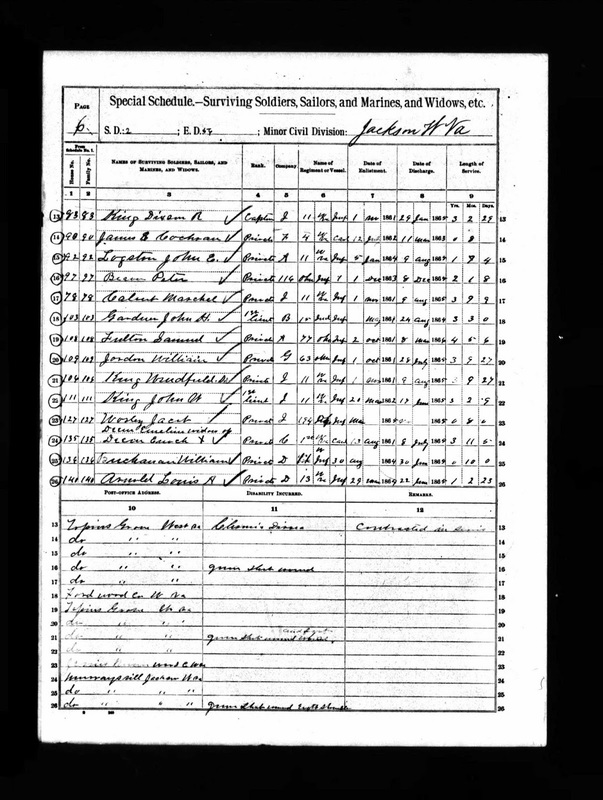 This is the page from the 1890 Veteran’s Schedule showing William Buchanan. The JOHN family has a few postmasters in its background. This position was due to two of our ancestors working with the rail system, Frederick William in Gillett and Victor Hugo in Wabeno and the surrounding area. Victor was in fact station agent in Wabeno for many years. This is a database of post office appointments stretching from 1832 until 1971. The records are mostly a register of people appointed to run post offices, but opening and closing of post offices, as well as Presidential appointments and Senate confirmations are included. The records primarily include name, appointment date, vacancy cause, vacancy date, post office location, state, county, and volume. I looked for William A. Shepard in the database, but did not find him.